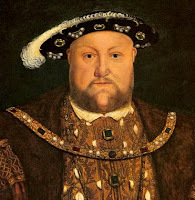 Henry VIII was born second son of Henry VII. The death of his brother Arthur allowed him to accede to the throne in 1509. He put his strong intellectual qualities at the service of his country. It applies to maintain good relations with France and Spain. He married the aunt of Charles V, Catherine of Aragon, but did not hesitate to ask for a divorce. He is denied by the Church. Until then fervent catholic, it is opposed to the pope and manages to make pronounce the divorce in 1533.